Webmin is a web-based GUI interface to manage UNIX and Linux systems. Webmin is also the base of which Virtualmin, the web hosting control panel like Plesk or Cpanel, and Cloudmin, which is used to manage virtual systems such as Xen, KVM and OpenVZ instances, are built upon. Webmin includes a very useful module that allows administrator to read any user’s email messages. The module, Read User Mail, is actually a simple email client to access the users’ mailboxes for almost every users on the server, and it’s one of the standard modules that is installed by default by Webmin. Log in to the Webmin control panel, i.e. https://your.server.com:10000/. Login as root, or a user with sudo privileges, wheel group users or domain administrators. If you login to domain administrator account, you can only read the mail of users within the domain. If you’re using Virtualmin or Cloudmin, click on Webmin on the top of sidebar. CLick on Read User Mail. 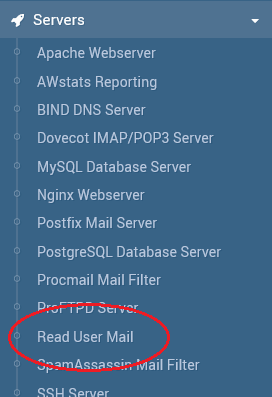 Select the user which you want to read the mails, or enter the path to a mail file or MailDir which you want to read. In the mailbox, you can change to read mails in other folders too.